Oh yeah baby! Fry me up multan. Its the 4th time that I asked the driver if the AC is working. He says it is. I am not convinced. You ask for any good place for shopping in Multan. And the answer you get is this three-storey Chenone Tower :p always – true story! The driver took me to a continental guest house :@ He was instructed to let me get rest. These Mothers! Multan is building its own defense after such a long time. Good opportunity to play on brand name for DHA. Ah! 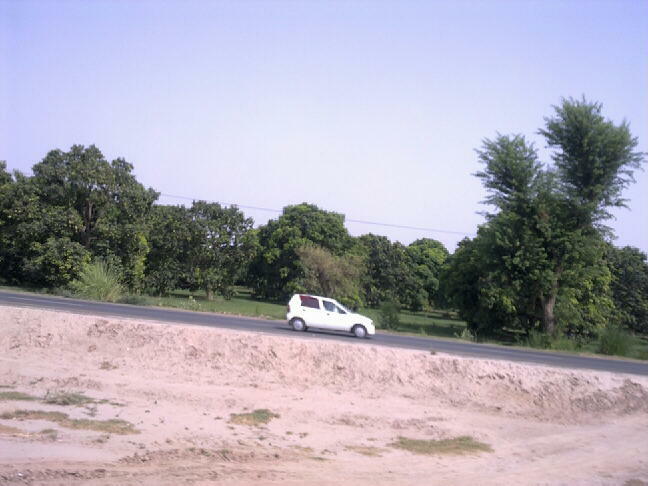 Tried to take a picture of Bahauddun Zikriya University – one of largest universities in Punjab. For me BZU is a university whose masters students can’t speak or talk in English – no offence please. Just saw a huge boars ‘Dubai Property Dealer – the best in town’ another Dubai dissed maniac? Pak Arab Fertilizer Company – an associate of Arif Habib Group has made billions by importing cheap fertilizers last year and selling high. Ok if any one of you has not tried daal mash with fresh roti on any truck wala hotel on any highway, you need to give it a try! Red colored cows are more abundant in Multan than any other city of Pakistan. A pride symbol it is! I completely fell in ‘love’ with this beautiful journey through your tweets, I enjoyed throughly whole day on my mobile. Great u some up all of them and posted a blog. This surely goes to my bookmark list! Would love to see another blog about this journey but with pictures and not words. :) Make sure the pictures speak next time! Enjoy your holidays and have fun, and don’t forget my fruits (ha ha).